As promised in this post, here are some pics I took from that amazing set of thunderstorms that rolled through here on Saturday. …And then, just as quickly as it had come it was gone. Like, within two minutes of the picture above being taken we went from absolute chaos to an exhausted, calm muggy dripping. No wind, just the occasional flash of lightning and dull rumble of thunder and the sound of fat drops of water dripping off the roofs. We later found out that storm caused nickel-sized hail just a few miles north of us and big pile-up on the I-10 interstate. I let go of the palm tree, grabbed my glass of Chianti soaked in rainwater, and went back inside and out to check out the situation out front. Streams of water were cascading down the street towards the storm drains. I couldn’t believe it – no one was out, no one seemed to care about the fantastic display and the power of God’s creation we were just treated to. 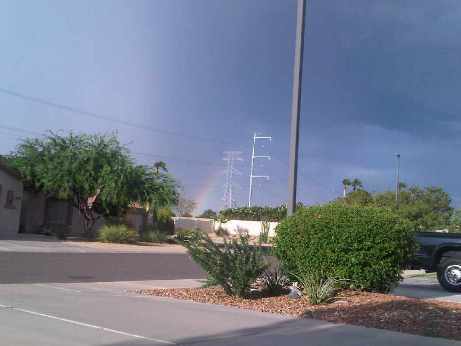 To the northeast, a rainbow you could see both ends of and a second one hinted at above it; unfortunately, I had no panoramic camera to show the entire arc. 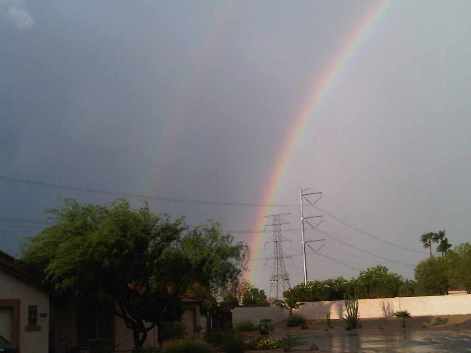 Just another day in the Arizona monsoon season. — An unemployment rate stalled in the mid-9s amidst growing fears it will once again approach 10% in the coming months. — The sales of existing U.S. homes sank 27.2% in July – the biggest one-month drop ever. — 2nd quarter GDP reduced from an already-meager 2.4 percent down to an abysmal 1.6, showing an economy that is slowing to a crawl. Horrible news coming just months before retailers ramp up for their critical holiday shopping season. — The President wading in on the plan to build a mosque just two football fields away from Ground Zero. Once again we see this President taking an ill-advised jump into local politics (as he did by inserting his administration into Arizona’s anti-illegal immigration 1070 legislation debate) and igniting a fierce debate pitting one group of Americans against another. Not only was it a stupid and tin-eared thing to do, it provided his critics with additional evidence that President Obama is not the uniter his campaign promoted him as, but a divider of the worst kind. It also re-ignited suspicions that he’s an undeclared Muslim by faith. — The Obama administration throws the state of Arizona under the bus in its report to the U.N. Council on Human Rights. Absolutely dispicable (and in my view, an impeachable offense) in every way imaginable. The thought of a U.S. President waging active war against one of the states is beyond reprehensible. We need our lawmakers in Colorado, and those who represent us in Washington, to start articulating specific proposals meant to restructure government to something we can afford. In Colorado, that means ideas for balancing the budget without decimating K-12 education, higher ed and social services; and in Washington, that means deficit reduction plans. The debate in Washington also will be about whether to extend President Bush’s tax cuts. We don’t know that extending the cuts will help much in the short term, but we do know that adding uncertainty to the already fragile situation is irresponsible. As the days continue to count down to the November 2 mid-terms and a Democrat disaster of biblical proportions starts becoming more than just a possibility, expect more of this. Obama’s administration has been a total failure, forcing even Democrats to run for cover. Key question: does the President come out and admit that he was wrong and plan a change of course after the midterms, as Bill Clinton so ably did after the 1994 GOP “Contract With America” victory wave? Given that Obama seems completely incapable of: a) admitting anything he’s ever done has been wrong, and b) giving anyone but himself credit for anything, the answer is likely a responding “don’t think so”. Which is fine with me. This clown deserves everything he gets – he’s taken an inherited mess and made it far worse than anyone might have expected. The unfortunate thing is that we as American are the ones taking all the shots – or, at least, the non-golf ones. The lame-stream media loves to portray the Tea Party, FOX News, and Glenn Beck as some kind of abberation from the ruling class elite; this event ought to change the dialogue. Lemme tell you, something is brewing this coming November that few will anticipate in its scope, breadth, and impact. I can only speak for hundreds of thousands – if not millions – like me: I can’t wait to vote and do my part to derail the Obama / Pelosi / Reid agenda that has been hell-bent on destroying this country. It’s a little before 11 PM tonight and the house is still. Like in, really still. Tracey’s asleep on the couch, the rabbits have been fed and attended to, and are in their normal busy nighttime regimens (eating hay, chewing grass mats, vegging out, etc. ), and I’m here nursing a cold Sammy Octoberfest and enjoying the fall-like weather that came upon us so unexpectedly after a a violent day weather-wise. I’ll have some photos on my Monday post, but today we had a series of thunderstorms that really lived up to the Arizona monsoon season hype. What changes weather-wise throughout the day! 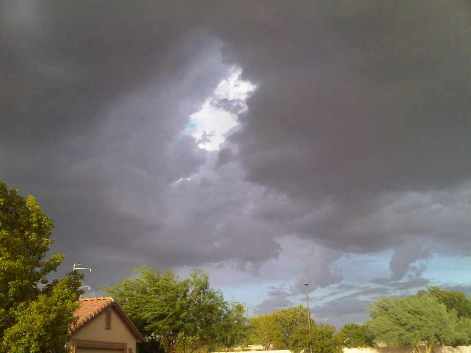 It started out hot and relatively dry, then the humidity started to build, followed by cloud formations to the southwest. 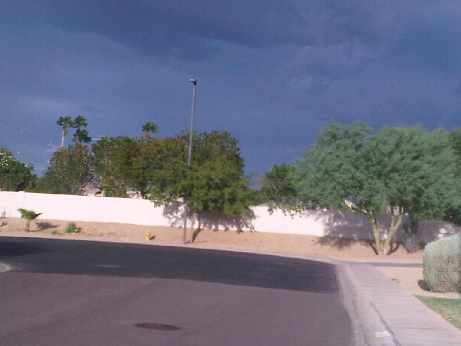 At 4:30 PM we had a dust storm blow in, followed by some heavy rain and, upon leaving, the heaviest humidity I think I’ve ever experienced here in Arizona. I mean, just being out for ten minutes and every bit of clothing on my body was drenched. Very unusual for around here. 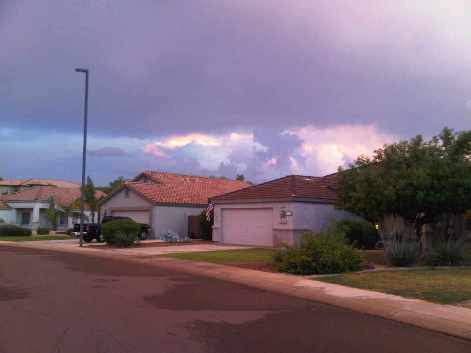 When the clouds started building to the southwest, you just knew someone was going to get blasted. Severe thunderstorm warnings were everywhere. As it turned out we didn’t take a direct hit, but it was heavy enough to blow screens off of our next-door neighbor’s windows and down a good-sized Palo Verdes tree the next block over. As the storm rumbled off to the northeast there were reports of nickel-sized hail, chaos, and extensive tree damage. For us, it was an unforgettable dusk complete with every pastel color imaginable, including a double rainbow and sea-green clouds immersed in lightning I’ve never seen before. The storm sucked every ounce of humidty out of the atmosphere, to the point where tonight I took a gorgeous swim in 89-degree water with the air temp at 84 going down to 78 and lightning still filling the skies to the northeast. It was a beautiful breezy night for a walk, so, beer in hand, I took a walk over to the next block where a chipper was making fast work of the downed Palo Verde. The air was full of that beautiful and uniquely musky scent of Texas sage in the air you get after any kind of rain, and I thanked God for being able to walk barefoot and in shorts around a quiet neighborhood with lightning flashing in the distance and a cool breeze blowing across my face. As a New Englander, I hate Arizona, but there’s a part of me that has come to love and accept it for what it is as well. Tonight’s sunset and moonlight swim I hope I’ll never forget. It was hard tonight stopping by the local pizza joint. Not just at the sight of the owner’s son (who I call “Mr. Visa”), or Brooke, one of my favorite waitresses (whose boyfriend recently broke off their engagement), but knowing that I can’t say when the next time I’ll be stopping by there for take-out, or what condition I’ll be in when I do. After all, next Friday Tracey and I will be off to Carmel, California to continue our “treasure hunt” (more on that later); the following Friday I doubt I’ll be in any frame of mind to yak-yak with my fellow bar flies and the hired help given that I’ll be just two days removed from my prostate removal surgery. It’s all so closing in. The days are getting shorter (tonight I had to put on my lights for the first time bringing take-out back), and this whole surgery thing is really screwing up my brain and peace of mind. Fortunately, today was the first day I was able to buy Sam Adams Octoberfest – my favorite beer in all the world (this year complete with a new label featuring trees with orange trees that almost made me want to cry at the thought of missing autumn in New England) at the local Fry’s. But you take what comfort you can get. My internal time clock tells me I should be thinking about Fall, but that’s nothing but fallishnessness around here. Even though the pool lost another degree today (it’s now down to 87), it’s still damned hot outside and there’s really no indication that Fall is on the way. Were I living back in New England, my musical tastes would have already started gravitating towards Fall-like music like Pink Floyd, Gordon Lightfoot, and Enya; instead, here in AZ, the late afternoon sun boring a hole in my forehead, I just threw some Gary Usher and the Super Stocks on the computer, since, the sun and heat and all, it might as well be June. But that’s OK, it is what it is, and one can do a hell of a lot worse! …So the word on the street is that our main man in Afghanistan, General Patraeus, likes Enya. That’s OK by me, her CD “A Day Without Rain” remains one of my all-time favorite CDs; you just have to be in the proper mood and locale for it. And living in Arizona does NOT promote the right mood and locale. As a New Englander there’s a part of me that right now aches to be back home. As a cancer sufferer, there’s a part of me that knows there’s some serious work to be done, in a very short amount of time. Our friend Jana will laugh at my admitting to liking Enya – I guarantee she’s one of her favorites. But like I’ve always said, I’m a sensitive guy – hell, I’m “Mr. Sensitive”! Don’t believe me? Here are two faves from “A Day Without Rain” – “Wild Child” and “Flora’s Secret” – that I consider amongst her best and amongst my all-time favorites. Enjoy! Like I say, I’m a sensitive guy. So, what to make of the fact that, his divorce being final, Tiger Woods goes out and shoots his best round of the year? All I can say is, nice work today, Tiger, let’s see if you can put three more rounds together like that. …and the same thing holds true for you, Michelle – one round does not a tournament make. Let’s see where both Tiger and Michelle stand come Sunday night. Jim Furyk gets disqualified from this week’s Barclays because he overslept and missed his pro-am tee time by a few minutes? How ridiculous is that? Sure, rules are rules, but in this age of cell phones there’s nothing wrong with giving the guy a break if he makes a quick call, explains the situation, and tells his foursome to hold on, grab a brewskie or two on him, and let a couple of other foursomes go on out ahead until he gets there. It’s good for everyone, and is the most common sense solution. …of course, in this Age of Obama, when you read things like this and this, common sense is the least common thing to be found. …and speaking of great golf shots, here’s a shot not even fellow Goodboy Ron “Cubby” Myerow would dare to attempt. I would, though…no shot is to difficult for The Great White Shank to at least want to give it a try. The clouds had been building all afternoon to the south and to the east, and the Accuweather.com radar showed some big storms building in both directions and heading towards the west. 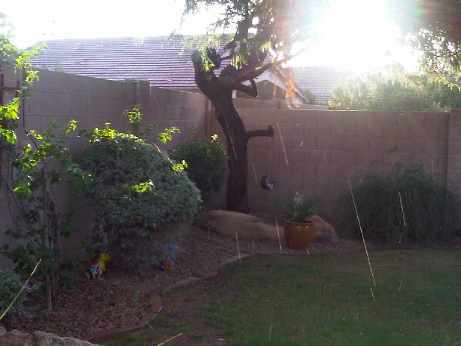 There was a severe thunderstorm warning up for parts of the valley, including us here in Gilbert, and I could hear the wind chimes on the patio and see the lemon tree outside the bunny room window being pushed around, but the sun was still shining brightly. This warranted an investigation. 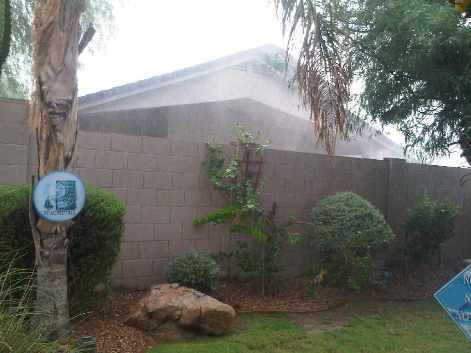 I poured myself a cold glass of Pinot Grigio and was just getting ready to head out the back door when all of a sudden there was a loud Whoosh!. The back doors (which obviously hadn’t been closed tightly) were flung open, and one of the phony palm trees held down by a bucket of stones followed through the open doors, it’s top end coming to rest inside the dining area, the stones poured out beneath it. I picked the palm tree back up and set it back in its place, and that’s when I noticed two branches from our palm trees by the pool bent down to the ground. That was quite a blow. Pretty, huh? A minute later it was all over, save for a few remaining rumbles to the north and west. 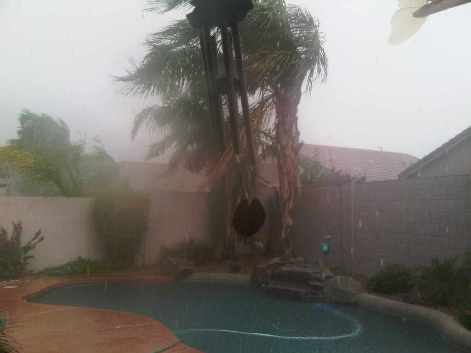 The pool was covered in all kinds of tree and plant debris, and our smallest palm, the one that has always struggled next to its larger and healthier neighbors, lost a critical branch that may not portend well for its future. I checked the temperature – it had dropped from 112 to 97 in just fifteen minutes – and checked my glass – it was in need of a refill – and began the arduous task of skimming the pool. The pool was still a season-high 95 degrees when I took a dip around 10 PM, but between the wind, the humidity being sucked out of the atmosphere, the rain, and the night, 24 hours later it had dropped four degrees to 91 degrees – that’s quite a big drop in just a day. 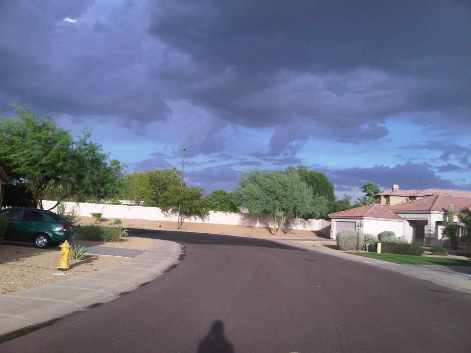 My swim tonight was in conditions almost – almost – like early “Arizona winter” – while it was still warm, there was no heat, and the patio beneath my feet was absent its typical heat as well. What a welcome change! That’s not to say we’re done with summer by any means – we’re still going to be in the low 100s for the rest of the week – and you can bet there’s still some sizzling days to come. But for one afternoon this year’s monsoon season provided a wonderful experience where I could forget about, at least for a brief time, all my cares amidst the unmatched beauty and awesome unpredictability of God’s creation on display. Fantastic. Congrats to Senator John McCain and Governor Jan Brewer on their Republican primary victories tonight. May you wipe the floor with your Democratic opponents in the general election a little over two months from now. One comment about my support of John McCain: you’ll see a lot of conservative outposts – like this, for example calling people in Arizona idiots for supporting someone who, if not a RINO (Republican in name only), is all over the board when it comes to issues. But I’m sorry: take your rigid, sanctimonious attitiudes and go screw yourselves. The fact is, J.D. Hayworth ran a lousy campaign practically from the start, allowed McCain to put him on defense throughout the entire race, and, frankly, gave few people a good enough reason to vote for him. My feeling is this: if you can’t run a competent primary campaign, what makes anyone think you’ll be a competent elected official in Washington? So the following are facts, based on the government’s own figures. Whenever you hear some Democratic strategist blame Obama’s deficit and his reckless spending on the Iraq war, you’ll have the truth before you. * Obama’s stimulus, passed in his first month in office, will cost more than the entire Iraq War — more than $100 billion (15%) more. (Hat tip: Instapundit). Expect to see the Dems drag out poor old W’s carcass in the days and weeks ahead, hoping to blame the economic mess we find ourselves in on W and the Iraq war, but they’re only masking their own gross (and, in my view, criminal) incompetence since they took Congress and then the White House. Fortunately, I think the American people are smarter than that and see what’s really going on. We’ll see come November, won’t we? I might be wrong – predictions are hardly my strongest suit – but I think this will be the most important political development, not just in this fall’s midterms, but for the 2012 presidential election. The angry, bitter, self-centered “it’s my body, everyone else be damned!” feminism from the ’60s is, thankfully, in its final dying gasps, being replaced by a more positive, intelligent, less self-serving, and more socially-empowered, family-oriented perspective. Keep an eye out for this, I’m telling you. This “new feminism” crosses every demographic and will be a force to reckoned with. Girding my loins for what the National Weather Service is promising to be the hottest day of the year here in the Valley of the Sun. Temps around 110, oppressive humidity, heat indices around 115 or higher. And I thought today was miserable, it only hit 107. I’ll tell you this: the pool sure noticed it, it jumped to 95 today. Welcome to the machine: A great Pink Floyd tune, one I couldn’t help thinking of Monday during my 30-minute stay in the MRI exam tube in preparation for my prostate surgery just two weeks from tomorrow. The MRI itself wasn’t that bad, it was the endorectal coil I had inserted into my cabooseskie throughout that made the experience less akin to the half-hour, “inside a tanning booth” experience the helpful and friendly tech tried to assure me beforehand. Fortunately, being able to contemplate and recite some of the Psalms I’ve become familiar with from my years of prayers really helped. Oh sure, they try to relax you with music they pump through earphones, but to be honest, if they ain’t got surf, they can play whatever the hell they want, I’ll just focus on the Psalms, thank you. Besides, being aurally assaulted by that crap they call “smooth jazz” from Kenny G and his ilk was almost as bad as the procedure itself. Yep. Something’s really happening. And like my very good friend and fellow Goodboy Ben “The Funny Guy” Andrusaitis is wont to say as he stares down a slippery downhill 6-foot putt for par: “I’m ascared”. No matter. When you have cancer it’s really just you and the treatment, no matter what form(s) that might take. And I’ve never felt so alone as during my prostate biopsy back in May and today’s MRI. But perhaps there are some things in life you just have to go through alone. …and it’s a big bright white one as I loll in the pool tonight. All around me the A/C units of the neighbors houses hiss and whoosh, turning off and on to the tune of their own varying thermostat settings. There are a few crickets out too, but frankly, with the temperature still at 94 at nearly 11 PM it’s too hot for them. So, it’s just me, the moon, the night, and the A/C units. With the pool temp at 93 there’s virtually no sense of temperature difference in my nighttime dip, the water is just wet. Really priceless to me. Reinforces my view that if I had to choose between being blind or deaf I’d choose blind any day.